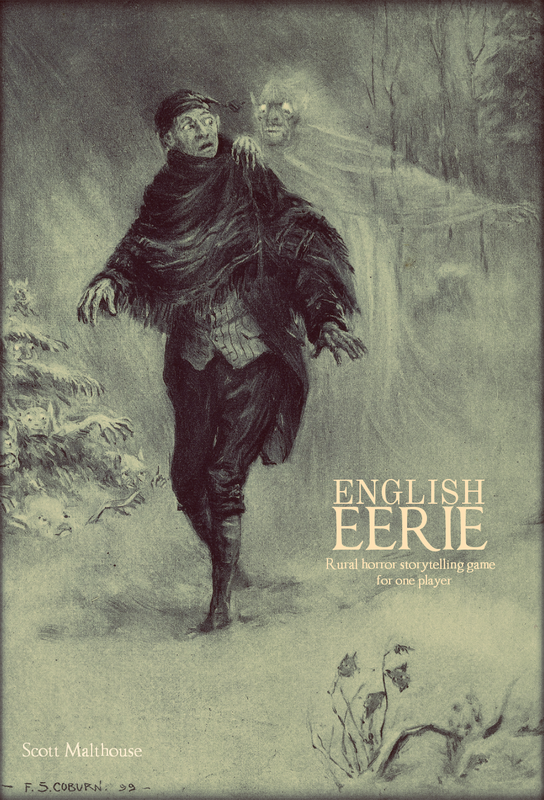 Every now and again I like to run a solo adventure with a lite ruleset, so I thought I'd do a campaign report here on my new In Darkest Warrens solo game. First off, here's what I'm using: Mythic GME, 9Qs and story dice. 9Qs creates the structure, while Mythic answers questions and the dice flesh out the world. It works quite well. Introducing Thurngast Goldscale, a dragonkin assassin out to redeem himself from a villainous past. He has a rapier, cloak and rope to begin with, with some money left over for lodgings and food. He's knocking around the town of Aynor, after having fled his murderous past as an assassin for the Shivering Serpent. 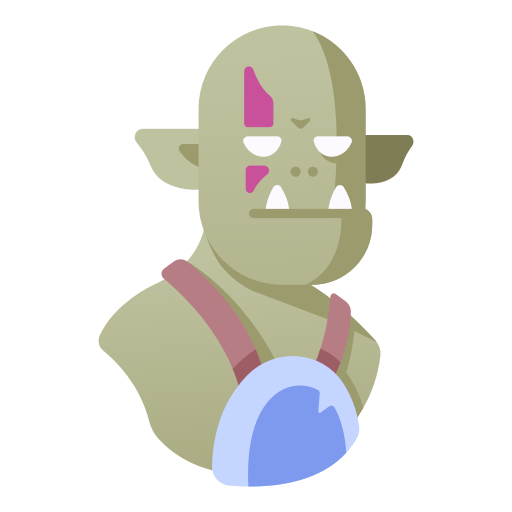 He has heard ravings that a farmer's head has been found on a pike on the north road and Red Orcs have been seen entering the farmstead. Thurngast saw this as an opportunity to help redeem himself, so went to meet with the mayor to see whether he could be of assistance (I figured this was due process and would keep Thurngast accountable). However, the mayor dismissed him, telling him there was no need to get involved. When asked if a retinue of guards would be sent to help the mayor said no. This was indeed incredibly odd. Knowing lives were at stake, Thurngast went anyway, along an eerily silent path to the farmstead, not finding any traps along the way. He cut through the cornfield, rapier in hand, brimmed with a venom he had concocted from a Gung snake's glands. Emerging from the field he saw the farmhouse with one lone orc standing guard. He had to deal with the wretch swiftly. After a flurry of blows, Thurngast came out unscathed, while the orc's body was sliced asunder. That was the end of the first session. There are a couple of questions that remain: what do the orcs want with a farmstead? And why was the mayor reticent to send any help? There is something not quite right in Aynor and Thurngast is going to get to the bottom of it. I'm starting a new blog series where I create Estagor, a campaign setting for In Darkest Warrens, my minimalist fantasy system. This is going to be kind of a mind dump area, where I brainstorm ideas and, with any luck, you guys can help me mould the setting. First I need to figure out what 'feel' I want the campaign to have. As this is coming from the British RPG scene, I would like to evoke that early 80s crust punk feel that art in games like Warhammer and Fighting Fantasy tended to have. A bit gritty, a bit dark and laced with black humour. I reckon if it were a soundtrack it would be later Darkthrone albums like Circle the Wagons and FOAD. Gary Chalk is a great example of an artist who creates this style of fantasy. 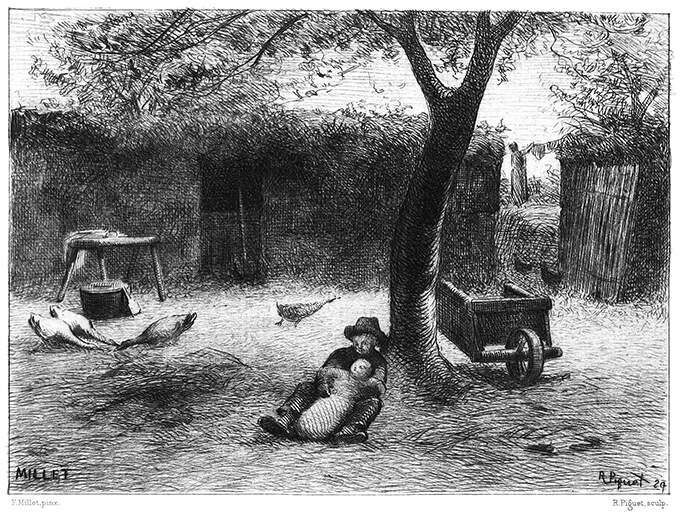 Here's an example of Chalk's work (but do go and view all his work on his website). 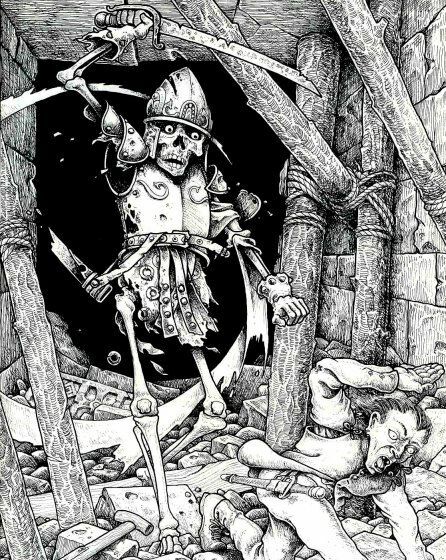 He's a bit of a favourite of mine, along with Russ Nicholson, for their incredible line illustrations that evoke this darkly funny fantasy world. So I suppose what I'm getting at is that Estagor is going to be a crust punk fantasy setting replete with dark humour. I don't want to go the Tunnels & Trolls route and make it obviously tongue-in-cheek, but perhaps a bit subversive. I'm thinking female rogues with mohawks and dirty cigarettes - very street level stuff. Next time I'll be looking at building the hook of Estagor. Hope you'll join me. By the way - don't forget to pick up In Darkest Warrens and share your own creations. Wizards has just announced a new 5e book for April 2017 and, guys, it's a bit of a curve ball. 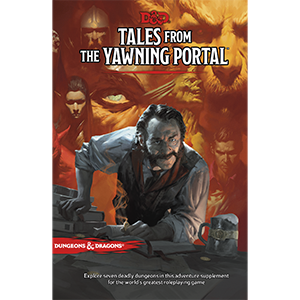 Tales from the Yawning Portal isn't the usual single module we're used to, but a mashup of several adventures from first and second edition D&D. So what have we got? 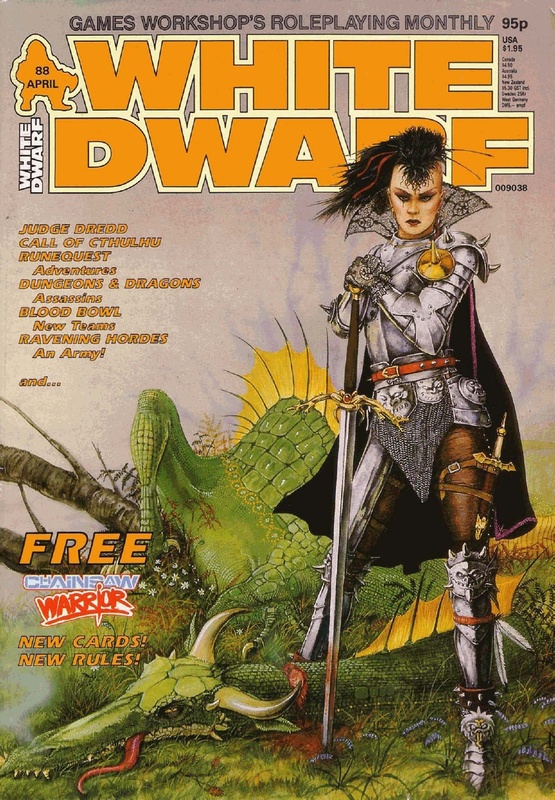 I have to admit that being a player who started around 3e, I've not been through any of these, but it does seem like Wizards is trying to take a slice of that OSR pie. Who can blame them? They did release a 4e version of Tomb of Horrors some years back but I can't remember how well received that was. I do remember that it was a bit more 'Fouthcore' than all those other frankly woeful modules for the edition. My first thoughts are whether it would be cheaper to buy the modules separately and just re-stat yourself, but I suppose this does save time having everything done for you. The book will take players from levels 1-15.